A unique collection of accessories designed to help you clean a very personal space: your car. Narrow crevices, tight upholstery, loose floor mats and tight spaces make cleaning a car’s interior a very difficult task. An extra long crevice tool for cleaning between seats and in side compartments. 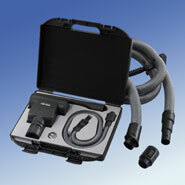 A Micro hose and combi nozzle to help clean tight and awkward corners of the dashboard. An extension suction hose that couples to your existing Miele vacuum cleaner hose to help moving around and cleaning the interior easier.